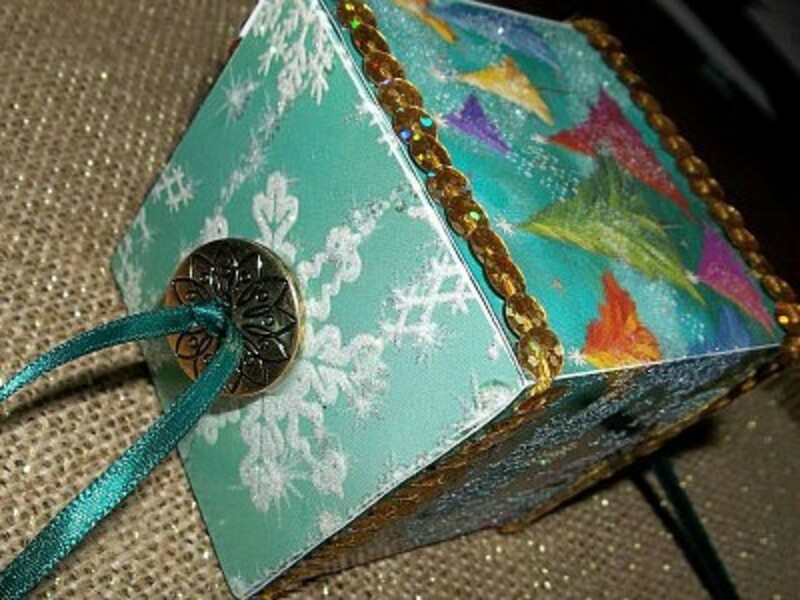 You can make beautiful cube shaped tree ornaments using old Christmas cards, some ribbon and a couple of buttons. It sounds too good to be true, right? 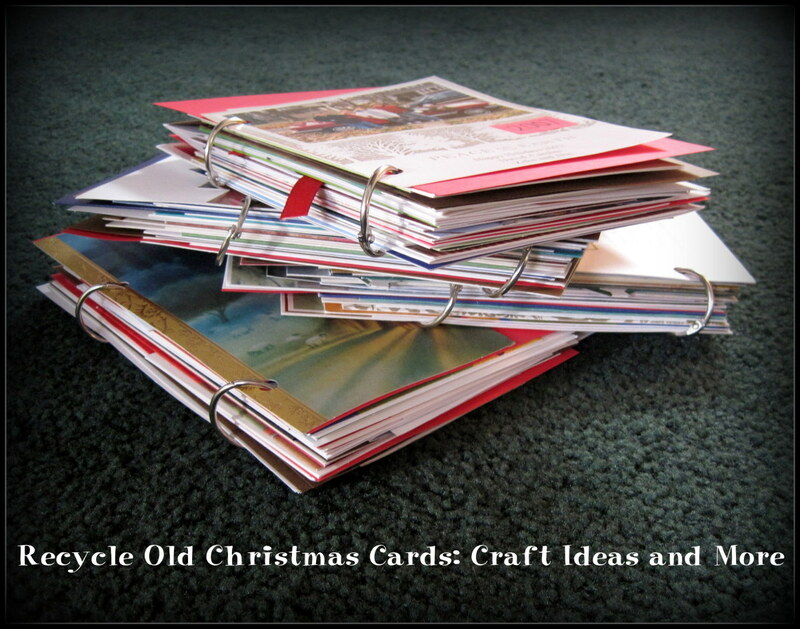 There are so many Christmas cards that are just too pretty to throw away or even to give away. 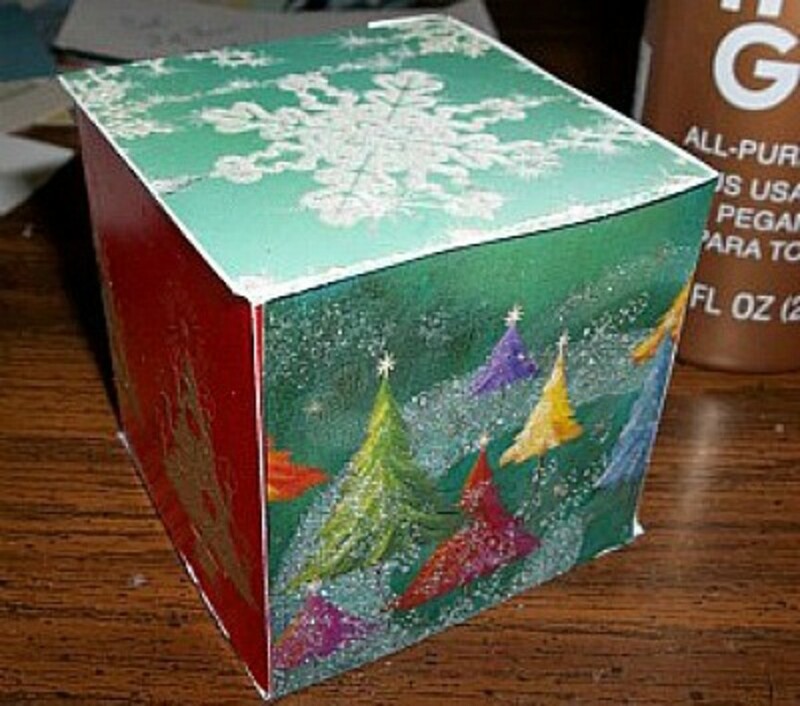 This cube shaped ornament lets you show almost the whole Christmas card, and if you want to remember who sent the card to you, cut the top or bottom of the cube from the signature area. 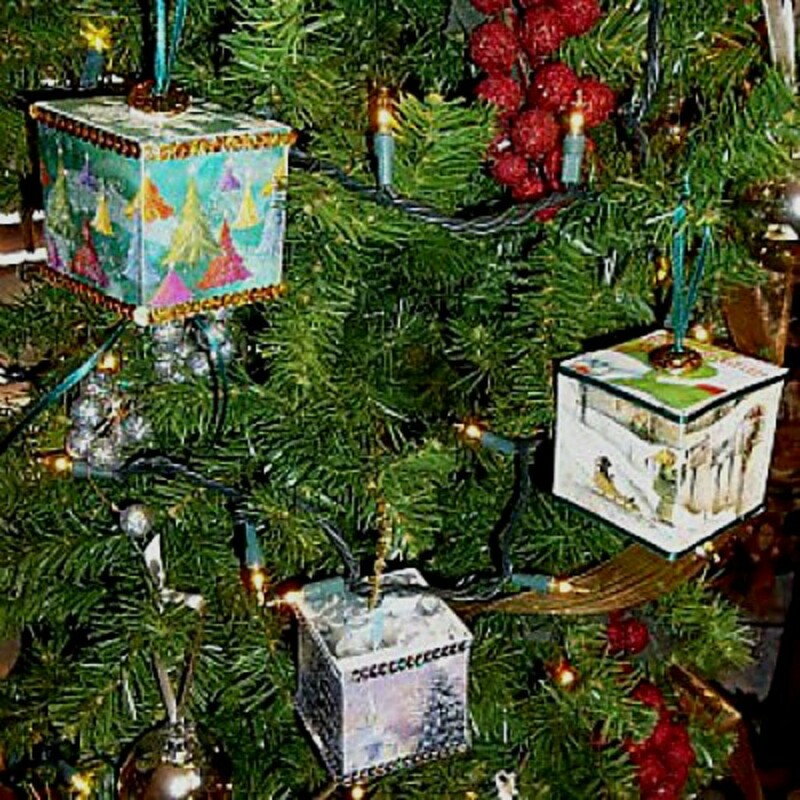 You don't have to display all the cube ornaments on the tree either, leave off the ribbon hanger and stack a few on an end table, place some on a wreath, tuck them in an arrangement or make a Christmas cube garland for the mantle. 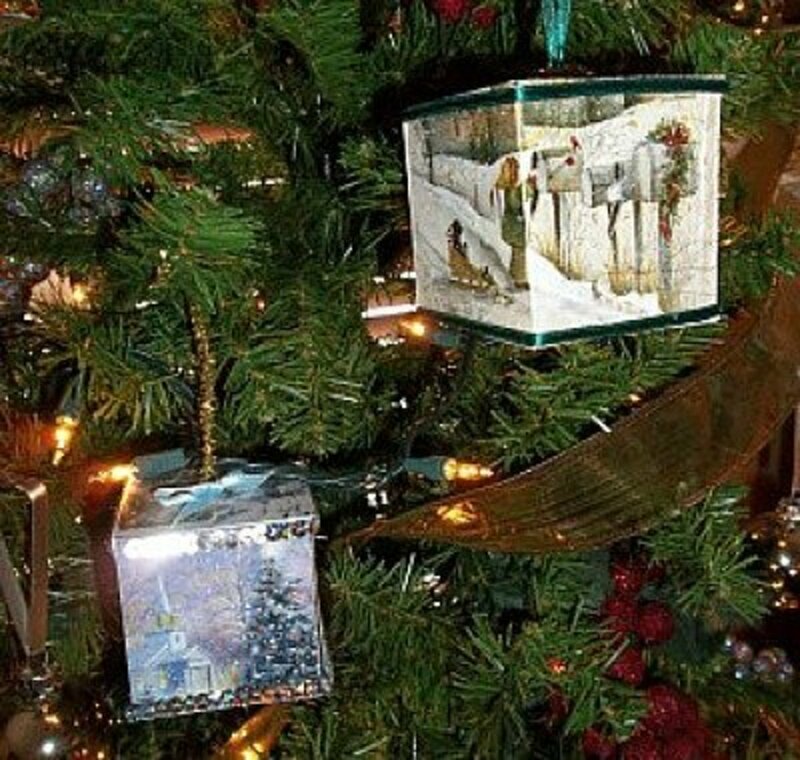 Once you see how really terrific these cubes show off your Christmas cards, you'll think up many more uses for them. 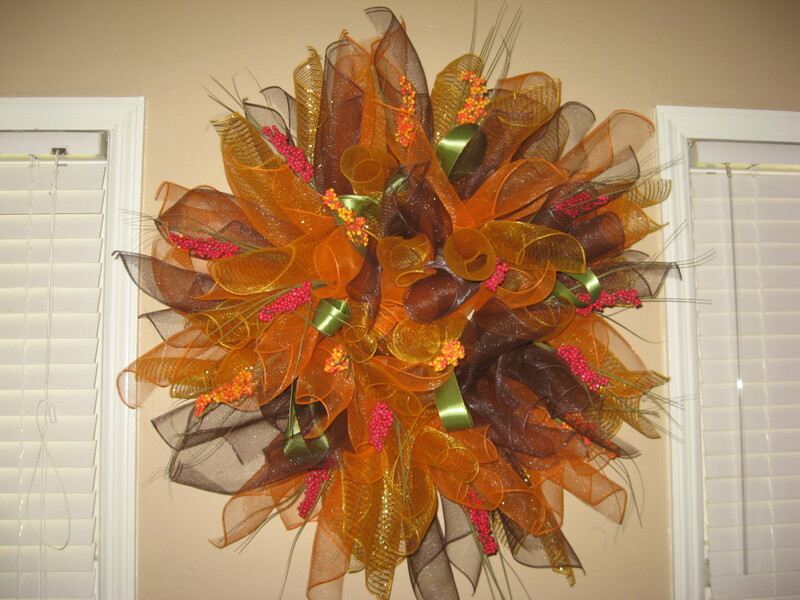 Narrow trims, ribbons, glitter chenille strips, etc. Print the patterns on cardstock. Be sure you carefully cut the "v" shapes where shown on the pattern. 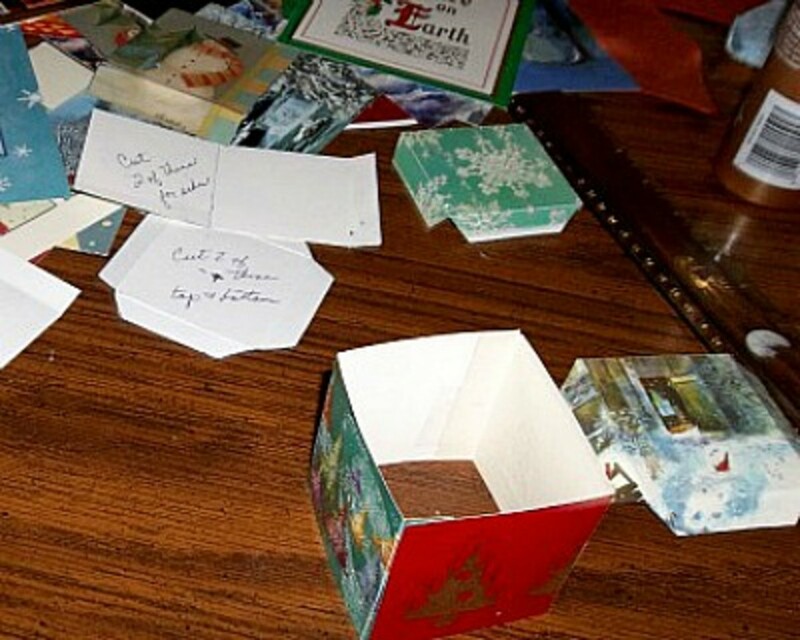 Then, when you trace the pattern onto your Christmas card you'll score across from one "v" to the opposite "v." You don't have to cut the "v" when cutting the Christmas card. Apply glue to the tabs on the side pieces, match to the straight side on the other side piece and apply pressure til they adhere. Notice that the tab is to the inside of the cube. 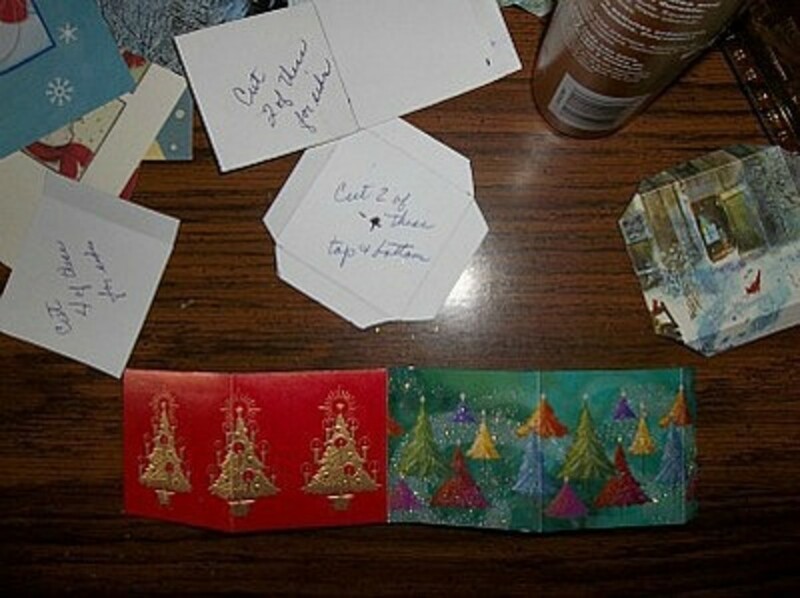 This is shown when wide Christmas cards were used. 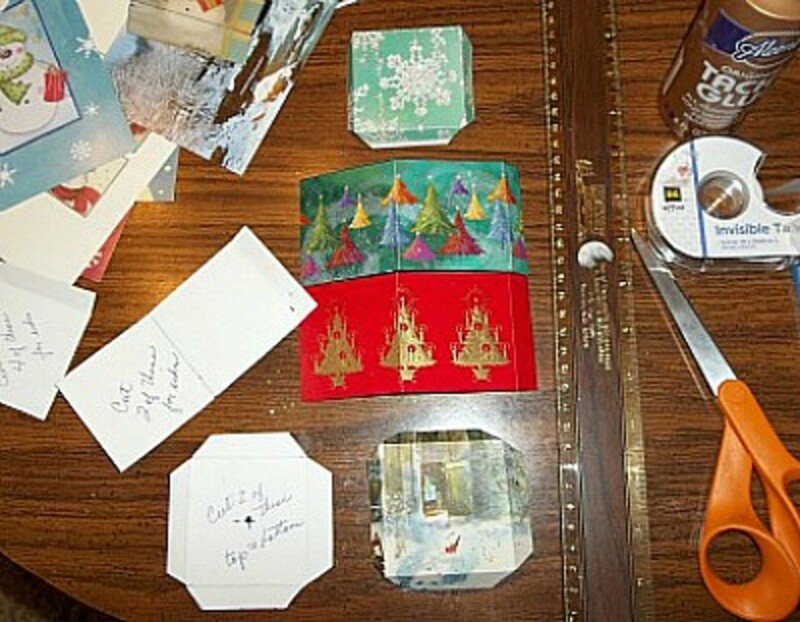 Use the smaller side pattern for the narrower cards. Each side corner is glued. If you want to make a hanger that goes through the cube, make holes in the centers of the top and bottom cube pieces. 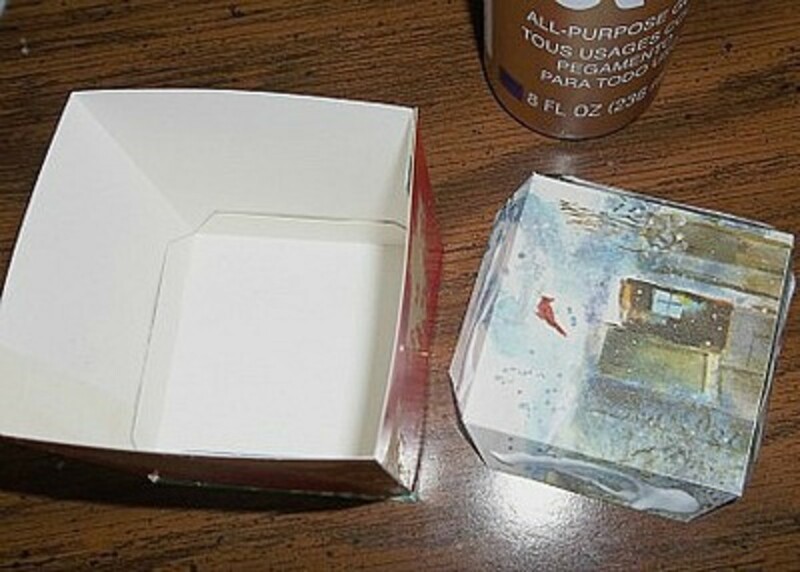 Glue the tabs on the bottom piece, fit it inside the sides of the cube. 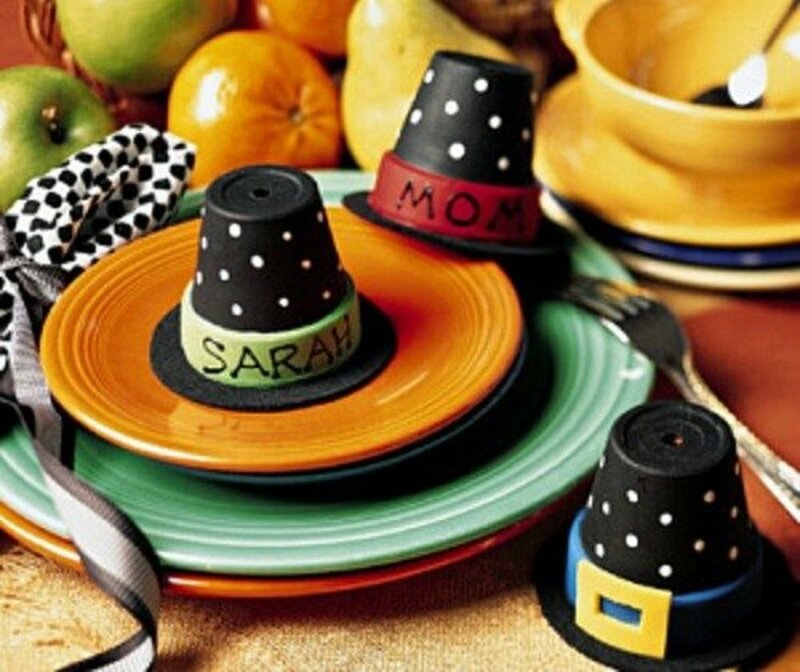 Place on a flat surface, adjust the bottom and press the sides toward the tabs. Apply glue to the tabs of the top cube piece and carefully slide into the top of the cube. If it slides down a bit, use a narrow blade to bring it back into place. Hold the sides against the tabs until they adhere. For the bottom of the cube, thread a piece of narrow ribbon through the button holes and glue the button to the center bottom. Tie a bow in the ribbon and let the tails hang. 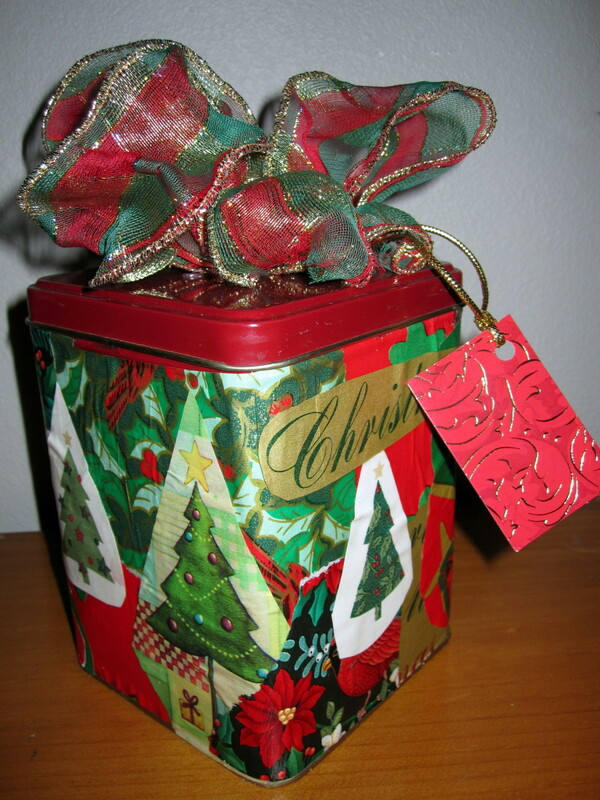 Apply trim or ribbon around the top and bottom of the cube. Decorate your cube in a variety of ways. Glue a bead or tassel to the bottom or maybe even bells. I used buttons that had holes in them. 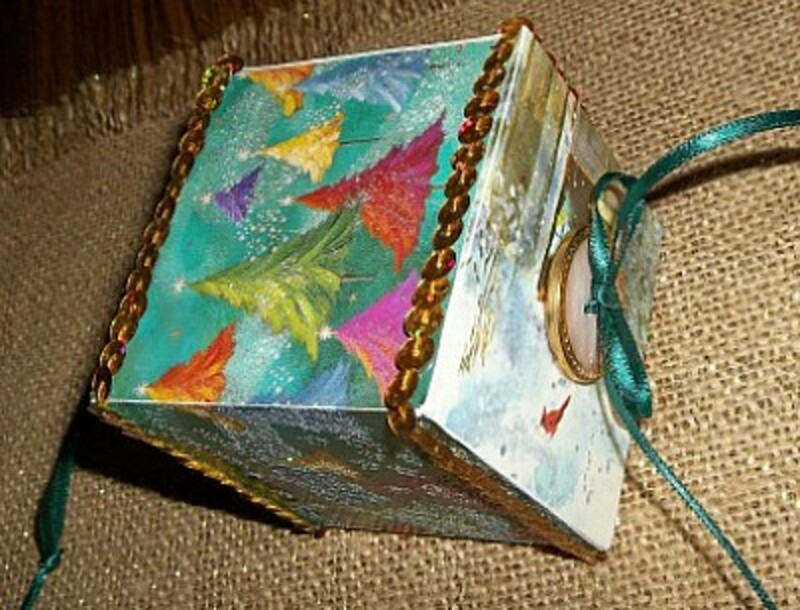 For the hanger on the top of the cube, Thread a piece of narrow ribbon through the button holes, tie the ribbon to hold the button, make a hanging loop with the ribbon and cut off any excess ribbon. Glue the button to the top of the cube. 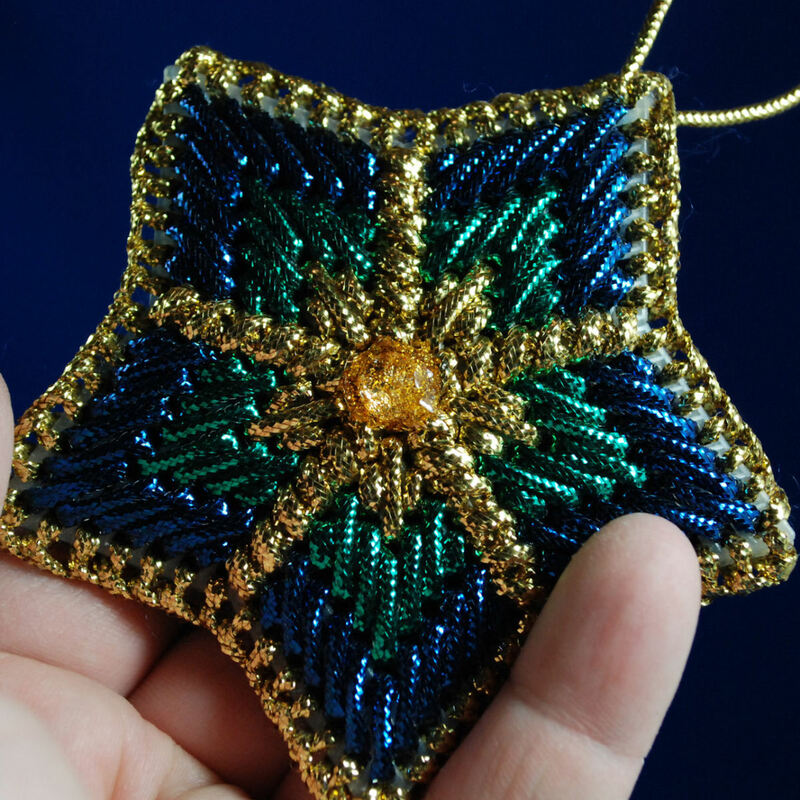 These ornaments will look great for years if you pack them away carefully when the Christmas season is over. It will be fun to remember when you made the ornaments, so print a tiny year somewhere on the cube. What a delightful ornament this makes. I'll be back next year for a refresher when I'm decorating my tree. 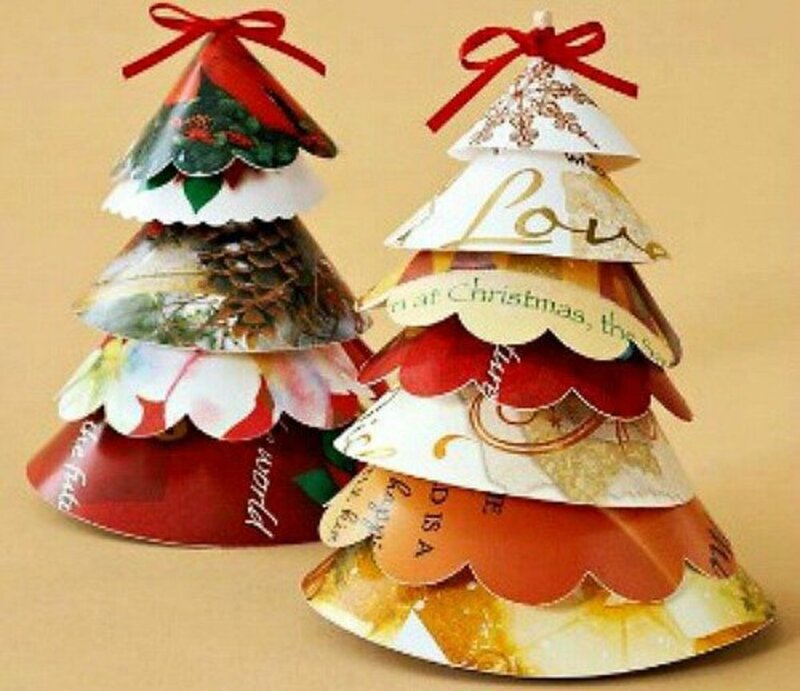 Love the idea of these ornaments. I'll definitely be making some. This is a very nice lens, its so helpful! I enjoyed it, thank you for sharing.